If you're looking to save some cash and you're flying from Terminals 2 or 3, Heathrow's NCP Flightpath car park might be for you. There's no hassle when you arrive, just drive up to the barrier, which will lift when the camera recognises your car, and park in space. Make sure you have your keys with you, hop on the transfer bus and you'll be at the terminal in 12 minutes. The car park has CCTV, barriers and regular security patrols, so you know your car will be in good hands. When you get back, just get the bus back to the car park and head home. Easy as pie! If you're looking for an affordable, hassle-free car park, then this is the ideal Heathrow airport parking for you. Discover easy airport parking just half a mile from the terminal - and you keep your keys! Save time and money with Heathrow's Flightpath car park, perfectly positioned within easy reach of terminals 2 and 3. With number plate recognition and no need to check in when you arrive, a stress-free getaway is guaranteed with this speedy parking service. It's a simple process when you arrive. The entry barrier will recognise your car and issue you with a ticket, leaving you free to glide straight through. All you need to do then is pick a bay and park your car. When you're ready to leave, the car park's courtesy shuttle bus will transfer you to the terminal in just 8-12 minutes. It's that easy! The car park has you covered when it comes to security. There's CCTV in use and automatic number plate recognition at the entry and exit barriers. The car park also carries out regular security patrols for added peace of mind, so you can sit back and relax in the sun knowing everything is in hand at home. Getting out is just as easy. Simply grab your bags and hop on the transfer bus, which will whisk you back to your car in no time. It runs between 04:00 and 23:40. If you get back outside of those times, you'll need to get a taxi. When you reach the car park, you just need to pop your ticket into the exit barrier when it's time to leave, and you're free to head home. There's nothing else to it. Be the first to discover Heathrow's Flightpath parking and enjoy a cheap and stress-free service when you book with us today. This car park only serves Terminals 2 and 3. Disabled facilities - This car park has 4 dedicated bays for Blue Badge holders which work on a first come first served basis. When you're ready to fly, catch the car park's transfer bus straight to the terminal. It runs every 20 minutes between 4am and 11.40pm, takes just 8-12 minutes and is included in the price. Outside of these times you can call the car park and they'll arrange a transfer back to the car park for you. Car park fine, but trickier than some to get into and away from. Bit of a long wait for bus when arriving home. Very handy for airport, friendly staff. Only negative point is the lack of signage when you leave. Would recommend and use again. 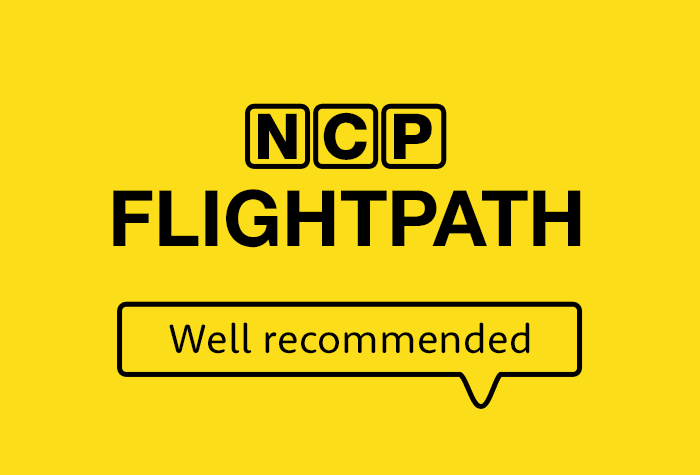 Our customers rated NCP Flightpath on average 8/10 (235 reviews). Read NCP Flightpath reviews.